Most times it's like rolling dice when making internet purchases. The burgandy wool felt fez was exactly what I wanted and I am very pleased in the quality of the item. It got to me quickly and I will tell my friends to order from here as well. The shirt arrived very quickly. It fits perfectly, and the material is very soft to the touch. The ability to switch the collar to a high collar is very convenient also. In short, the shirt exceeded expectations. GREAT COMPANY. The quality on all so far is amazing. Lost count how many purchases, at least 2 per month. I do not often give reviews, but my experience with Gentlemen's Emporium has been so positive I felt I owed it to them. Not everything started out perfect (the outfit we ordered was not the correct size), but that wasn't their faut and they (Gentlemens Emporium) worked hard (above and beyond expectations!) to help it all come together/end perfect. Everything was as it should have been in time for my wedding. We (my now husband and I) ordered (for the groom) a shirt, vest, jacket, tie, and pin from here and couldn't be more pleased with the product and, of course, the customer service - they're persistent assistance in trying to help us find and get the right size and to help keep things financially within our budget created an outstanding impression for me, one that will keep me coming back to this place for further purchases in times to come! Also I feel good about recommending this place to others because I know that they (Gentlemens Emporium) will provide you with what you want AND their products truly are AWESOME! This hat is not only beautiful, but made in USA. It is elegant, and even with my short (non victorian!) hair, the strap kept the it on my head. I look forward to wearing the hat for a great many re-enactments. Fits well, looks sharp, I'm very pleased! Now I need a top coat to go with it. On somewhat short notice I was invited to a Time Travelers' Weekend at a Renaissance faire. I needed a simple costume for the event. 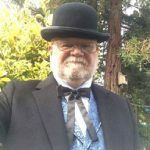 I found Historical Emporium, and discovered that they have a special steam punk sub site. I settled on my purchase, but I needed to know that it would be delivered on time. Instead of ordering through their website, I called them directly. The merchandise I wanted was in stock and they told me that if I placed the order, I would receive it on Friday (this was Wednesday). They made good on their promise and it was delivered on Friday. They offer standard and two-day shipping. They do not offer one-day shipping, but the website explains why. The pictures and descriptions of the merchandise is accurate and fun to read. The two pieces I ordered were of superior quality - this is not cheap Halloween costuming, but real clothing. The quality is well worth the price. I placed my order for shirts on Friday. On Monday I went to check my mail at the Post Office and my order had arrived. I still don't know how they did it, amazing! It looks and fits better than the picture. The picture does not do this skirt justice. This vest is wonderful - stunning colour, very comfortable, and the wool makes it toasty warm. The style and texture are decidedly professorial. The cut is really good for women because the armholes don't gape awkwardly, unlike some vests. It's my favourite vest right now. I'm going to buy a different colour Winfield vest as well so I don't wear this out too soon. These are awesome but I had to send them back! Gorgeous and comfy. I read all the reviews and believed I should order a half size up, a 9 1/2. I was out of the country. When I got home I was too busy to try them on other than a quick try. When I got around to trying them on, my heels were moving up and down inside, they were too big, i should've ordered my regular, actual size. I went to exchange but they are now Closeout and my actual size 9 was gone. Had to return them but found my 9 at their manufacturer's website. The Historical Emporium ones I sent back actually had prettier, smoother leather than the ones I am keeping, but, they're still totally cool. Great suspenders, what else can I say. The extra few bucks really finished the outfit. Stays firm on my head while riding my motorcycle! Great fit as I have difficulty finding hats that fit my melon. Great fitting & comfortable. Definitely need to hem or turn under. These trousers could use a bit more reinforcement at the edge of the pockets. Overall pleased. Great gators!! These are cool & will be also wearing them when I ride. Got my order in a timely fashion, despite apparently being backordered. Good Quality merchandise... not cheap costume-wear. I was concerned about the sizing being different from what I was used to, but the measurement guide on the page was spot-on. They fit my shoes perfectly and don't impede me while wearing them. They fit over tennis shoes as well, giving me the ability to wear comfortable shoes without my shoes breaking the illusion of the overall outfit. The quality on this is wonderful, and going off the guide on the page got a perfect fit, despite my portly figure. The mad scientist job doesn't come with a gym membership. I had originally intended to design and sew my own, but nothing I would have made would have looked as good as this, and the materials would have cost more for my troubles. This is my second pair of Veil Granny boots and I love these as much as the first (Antique Leather). These are no Halloween costumes bound to fall apart after 3 days. These are made to last. I will say one idea is to get a size one up from what your waist is and go to a tailor. It means a better fit for you. You have to remember that they make these pants for many body types so the fit will not be perfect. One trip to my tailor and I look like a million bucks. I will be purchasing more. Fits me great and is a great look. Lace work is well done as well. Cheers, Véronique. This tie tack tacks a tie terrifically. These crimson trousers were as dark upon delivery as they were in the site's pictures, which was awesome. Great quality, no complaints. Would highly recommend to any airship captain looking for the ability to conceal wounds during battle. Excellent quality and a distinguished pattern for the gentleman adventurer. I love my Cravat looking forward to continue buying from this company. Super fast shipping and high quality product. Product was just as described. Very nicely done. Arrived on the day they said it would. Very pleased with overall transaction. My entire order came quickly and in very good condition. The parasol was wrapped well and works very nicely. It will be a "hit" at my nieces steam punk wedding. Just what I expected. Good quality for the price. The jacket was well made, alterations were minimal. The swimming dress is very well made - it's cute! I would caution (and thank you for publishing your reviews when I purchased mine) to order a larger size. I wear size 8 and ordered a size Large dress - it fits very well. I didn't think it was as much tie as I got from the picture. I put the pieces together with a stick pin and it worked out well. You are a well organized company. Quick response to an order placed on a Sunday evening, shipping out next day. First class! What a simple pattern! It irons very well as it will lay flat - can't wait to use it with the swimming dress. My ONLY disappointment in this outfit was that the bloomers were not available and I had to buy a pattern and material to make a pair. I really like the material and cut of this skirt. I'd read that this ran small so I was surprised at it actually being a little big for me. I was also surprised by the length of the skirt. I'm 6' and the skirt almost touched the top of my boots. I'll actually shorten it for what I using it for. I was very pleased with the item and was not expecting the matching pocket square (a very pleasant surprise)! I would definitely purchase again and look forward to purchasing items from the site in the future. I got both this jacket and the matching skirt. Having read that these ran small, I was surprised that they were both a little big for me. Not enough to go down a full size, but enough that I'll have them taken in a bit. I'm using these as my wedding dress so pretty excited! Nice cut on the jacket, love the detail in back. I have hats I've bought around the country but none compare to the quality and fit from the emporium. The skirt is well made and fits perfectly. Thank you! I bought vests from you a couple years ago for my son's wedding. Loved those, got tons of compliments on how great the guys looked in them and passed your website on. Now, it's my turn to get married again and came back. Alway great product, fast shipping. I haven't had to return anything yet! Thanks guys! The Cameo Choker was just what I was looking for to complete my outfit, It is of good Quality. I like the idea that it has a adjustable chain on the back to hook it to. I could not believe how fast I received my Choker. It was just what I was looking for. I will be ordering more items from you and I will tell others about you. The Moustache is not White, but off white, smaller than as shown, and doesn't look like real hair. I cannot believe my order arrived so quickly - thank you! I will definitely recommend your site to others. The Aurora is a beautiful blouse - the picture is not true to color though, it is more of a pinkish hue than cream. I was not able to use it for what I purchased it for but kept it because it will work for another outfit. The quality of the blouse is excellent. When the item I purchased was not what I expected in color Historical Emporium was quick on a response and offer for exchange or refund. This in the end was not needed but showed they do care about a customer being happy. I would recommend them for any of your needs and will definitely be purchasing from them again. Great hat, made in the USA! Great Quality product, exactly per the pictures and description - Delivered faster than expected and packaged well to arrive in good condition. Since we were invited to a wedding with a steam punk theme, we went on-line to check out some of the clothing lines that were available. Of all that we reviewed, we liked what we saw at Historical Emporium. The service was fast and the products were top-rate. I had to play a bit with the sizing because the women's jackets ran closer to British sizing than American, but the men's sizing seemed more like what we expected. In all, it was a good experience and we will use the store again - even without the excuse of a wedding, which ought to be a totally unique experience. We were going to order just one outfit apiece to start cowboy Action Shooting as a family. As a seamstress, I had planned to make my own outfits. There is no way I can make pants of this quality for this price. They are rugged, fit well and look amazing! Thanks! We were going to order just one outfit apiece to start cowboy Action Shooting as a family. As a seamstress, I had planned to make my own outfits. I bought these for my son. There is no way I can make pants of this quality for this price. The only problem is he will out grow them long before they even begin to look worn at all. They are rugged, fit well and look amazing! Thanks! I love my necklace. Was exactly what I needed for my outfit. I have been very pleased with the customer service. I received everything on time for an event and all items were just what was advertised. They were above reproach. Thank you all. Yes, I was satisfied with the service and fast shipping. And I will make other purchase in the future. Order came in just a matter of a few days. I would certainly order from you again. Received the cane we ordered within a couple of days. It is of excellent quality; will buy from this company again. The Callahan frock coat is well put together and worth the purchase. The torso length is fantastic, the sleeves were a bit short but whatever (I am built like Jack Skellington). My only complaint is it's material. For $150, it's your basic dress jacket material, I expected something heavier but that could be my fault. Either way, it's a great buy. The belt is great. Good quality. Excatly like the picture. However the sizing is off. It recommends to get the belt 4in bigger then normal size, which I did however it was still way to small. I was able to still send back and they sent me a bigger size which will work. I ended up getting 10 inches bigger then normal size. I placed my order in the afternoon and I received it the following day without having to pay extra for the fast shipping. Then I had to ship it back because it was too small. I exchanged for a bigger size and that one had fast shipping too. That was awesome! These pants look and feel great. They are a lot heavier material than I expected, which is welcome. You will need to get them hemmed to your height, I'm 6'2 and the legs swallow my feet, but not a complaint. This isn't Target. I've been trying to find just the right pair of pants for a costume I'm doing for dragoncon and i stumbled upon you're website after weeks of searching. As soon as i saw them i fell in love with the fall front trousers. Upon receiving the pants i was even more happy, the fit is exceptional, the quality is fantastic, and it was exactly as i had imagined. Very pleased, look forward to shopping with you again. This vest is gorgeous and the size is spot on. My only complaint would be that the pictures just don't do it justice. This vest is lovely and the size is spot on. My only complaint would be that the pictures just don't do it justice. You improved on even MY gorgeous husband! its nice but I should have gotten a size smaller. It does really look good. Quality product. Sizing was spot on. Most recreations would just have decorative buttons, but this one has so many functional buttons. The detail is fantastic. Historical Emporium is the place for all your victorian thru Edwardian needs. Great holster for the price. Fits my Denix Griswold and Gunnison replica pistol with just a little bit of the barrel coming out the end. Coat was just as advertised. Runs large to wear as an overcoat so pay attention to that when ordering. I did, so it fits perfect. I have ordered many items from Historical Emporium and they have been delivered promptly and were as advertised. The website is always very clear on sizing and return and exchange policies. What a great resource for historically accurate attire. Kudos to them. Love my blouse. Just what I expected. So sad you discontinued the skirt to go with it. It's beautiful and fits me well. I found you on-line. I'm happy with my purchase. Service was excellent. You stood by your guarantee. The young lady who assisted me at your warehouse was very helpful. I will shop with you again and I have already recommended you to others. The Herringbone Wool newsboy cap is a classy piece of American workmanship, not an import, at a very affordable price. Just the feel and heft of it conveys the sense of a quality made product. It will receive extensive use during our live theatre stage performances. This is a nice shirt, but two things are less than great. First, the creases don't come out totally with steam, it needs to be pressed with a cloth. Second, the sizing is way off. I chose XXL because it said "up to a 46-inch chest". The garment measures 62" in the chest, way too much. Nobody needs that much fabric bunching up under the arms if it's worn with a waistcoat. I'm keeping it and hoping it works out okay, since its very drapey. Looks very nice, but really, they should give garment measurements so we can make our own choice about how much extra fabric we want. It's a lot of fabric to tuck into breeches. The description actually says it's a bit narrow through the body, so order up. That's nonsense. It's gigantic, believe me! A huge square. Ridiculous. This attention-getting desk bell has the great nostalgic sound of the hotel desk summoning the bellboy to the front desk. We will use it as an integral sound effect for our live theatre stage performances. The shirt fits very nicely and look superb. I can't wait for the weather to cool off so I can wear it, alittle too hot now. I highly recomend this product. First of all I was impressed with how neatly packaged the skirt was when it arrived. This is a high quality skirt, the fabric is heavy and has a lovely sheen like texture and drapes very well. I love all the satin laces for the cinched waist. I cant wait to wear it, I just know Im going to get lots of complements. Did not receive the right waist and width size belt that I orderd. The dress arrived the day I was told it would. The fit was perfect and the dress looked just like it looks on the site. I am very pleased with my purchased. Item was used for historic event. Wearing it I felt like I was in the 1900s Everything I ordered from Historical Emporium was fantastic, so was the service on an item I returned because of my mistake. They still resolved it very quickly. Thank you HS !!! I really liked the black lace gloves. They fit perfectly. This was a really nice hair net. Adorning ones neck is the finishing touch to the victorian Gentleman. For an easy to wear item that draws focus to a shining touch of class a satin hook on tie is a great alternative to mastering the multitude of tie on style cravats. If you want to keep it simple and keep it sharp this is an ideal item to chose. The victorian Gentleman's armor has got to be symbolized by the vest. The Humboldt Stripe Vest makes you look like sophisticated perfection when matched to the Humboldt trousers. It looks great with black or brown trousers too. The material and craftsmanship match the superb standards of a Emporium merchandise. This is arguably the favourite look among my several victorian outfits. The pleated Cotton Pioneer Apron is made with heavy cotton and is extremely comfortable! I cannot wait to wear it at our historical society benefit next month. While we're not celebrating "pioneers," we are toasting our town's maritime history. The whalers and fishermen's wives did a lot of cooking! I feel like Mrs. Patmore when I wear this cap! But I won't use salt instead of sugar... It's of fine quality and it will look perfect with my Cotton Pioneer Apron! I was delighted with the service I received from Historical Emporium clothiers. Before I knew it, my package was on the front porch. Bravo, bravo. Can you kindly write a handbook about customer service? It would be a bestseller! I like these pants. They are made for men, but I had them hemmed and such and they are quite comfortable. I can see how they would be warm in winter as well. This is really good products and I love it ! I recommend this brand . I had tried using an inferior version of this coat from a competing vendor and was dissatisfied at every turn. From the silver buttons to the full lining, this product is superior in every way. The weight of the woollen goods is sufficient to provide a modicum of warmth on cool fall mornings but not so heavy as to cause one to perspire in the afternoons when the sun has been up for a good number of hours, even after walking for some time. The cut is full enough to provide coverage for the handgun a gentleman normally wears during the day but not so bulky as to make it difficult to deal with when sitting down or mounting to the saddle. The buttons are firmly fixed with a good weight of thread and a generous number of stitches and they resist pulling off even when snagged on the Martingale or other part of tack. All in all, I expect this garment to provide me with many years of service and am happy to offer it my endorsement. Dear Sir/Ms I'm pleased to be able to say that I'm a very happy customer. Your prodict description was accurate, your sizing information spot on for me and the product is excellent value for money. Dear Sir/Ms Your communication re delivery was first class. You accommodated to meet my particular delivery needs and the delivery occurred under the time estimate I was given. Thank you. The spats I received were really good, fine quality as I had expected them to be. Thanks these are great! I got the gloves..they were a perfect fit!!!!! They are very comfortable to wear. My only gripe about the product is the fact that the fabric is thin and the quality was ok but not optimal..when you put your hands inside the gloves, they don't look as opaque as they should and the seams look bright white. I wouldn't have minded to pay a few dollars more to get something of a little better quality. For the price paid, these gloves are ok! they do the trick!! I had just about given up on finding a reliable online store that sells good, quality fingerless knit gloves, after having seen countless postings elsewhere with customers complaining about fraying gloves or too-tight fittings. But lo, when I happened to be perusing this site for character costume reference (which, by the way, you guys are a FANTASTIC source of costume ref, especially for good, realistic steampunk costumes), I came across these gloves. Though the price at first seemed a bit high for fingerless gloves, I figured my only other option was to drive two hours away to the nearest mall and hope against hope, and I had some commission money to spare, so I went for it. Boy howdy, am I glad I did! These gloves fit absolutely perfectly on my somewhat small lady fingers (your suggestion of Medium sizing for ladies is spot on!). They are nice and toasty while not being overly hot thanks to the bit of looseness in the palms, and have just the right amount of grip around the fingers without cutting off circulation. The shipping was also remarkably fast, arriving precisely as advertised. I absolutely adore these gloves, and this store! Well, the service received in this of great quality. You can really become the refined gentleman and be treated as one. I bought a monocle, spats and gloves. They are quite nice and perfectly fit my costume re-enactment purposes. I would definitely recommend this seller, I received my goods in a reasonable time frame and I live in Canada!! The skirt came, and is exactly as described. I am very happy with the fabric, the sewing and the construction. It fits to size. I am looking forward to wearing it. The fabric is truly lovely, and heavy enough. Very nicely made. I bought this for a heritage festival next month. I have shown it to a few friends, and they can't get over the quality, and the rather inexpensive price. It is truly lovely. Very nicely made. I feel like I got a great deal. It's a truly lovely apron. Would make a great holiday gift, too. Good Morning: The description,size for fit,shipping,etc-All went smoothly and am well pleased with the product. Loved this skirt! Liked adjustable waist band. Beautifully made! With a few adjustments and some ribbon and lace, I made this into a bonnet to wear in the reenactment of the battle of Lake Erie 1813.. I could not be more pleased. Received my order in a week and everything was as described. I would order from this Co again when need be! Thanks so much!!! I wanted to order a jacket from the site, but the time to deliver was going to be too long. Not only did they tell me a true time for the delivery, they recommended me to another site who was able to deliver an equal product, and I could have my outfit ready for my event. I also needed a few items as well and they delivered! Great look, great feel, super sturdy! The skirt was exactly what I thought it would be. I needed a costume skirt which can be used for multiple costumes, and this is perfect. Elastic waist, so comfortable. Light enough that you can pin it up on one side if you wish. The hem is a little rough, but that is easily fixed with a pair of scissors. A good buy, not too expensive. Very happy with my purchase. These guys are what service should be (and sadly often isn't). We had a very tight time frame, and I was concerned that I would not get this integral part of my costume on time. Not only did I get it in plenty of time, but they communicated immediately back to my every question. These guys are great, and I would definitely buy from them again. Wonderful little trinket. It will go great with my other steampunk accessories. Whether a costume party, or wearing it in public to read reactions, this is a fun coat. The difficulty of buttoning it is understandable. I'm thinking of adding a few pockets, and I would prefer if this was a more maneuverable, a little thicker, and a softer cotton fabric. But for the price, this is great. 4 stars! Very Nice. Happy with item. Lovely fit. nice and soft. should be great for driving old cars! Very nice.. just a tadd too long though will have to have the elastic shortened, but otherwise great.